Vinyl Siding, this is where I actually started my career in construction indusrty. Some of you might be familiar with my first company, A-1 Siding, Construction, & Renovations. Vinyl Siding is one of the most widely used exterior siding they have out there and for a good reason. 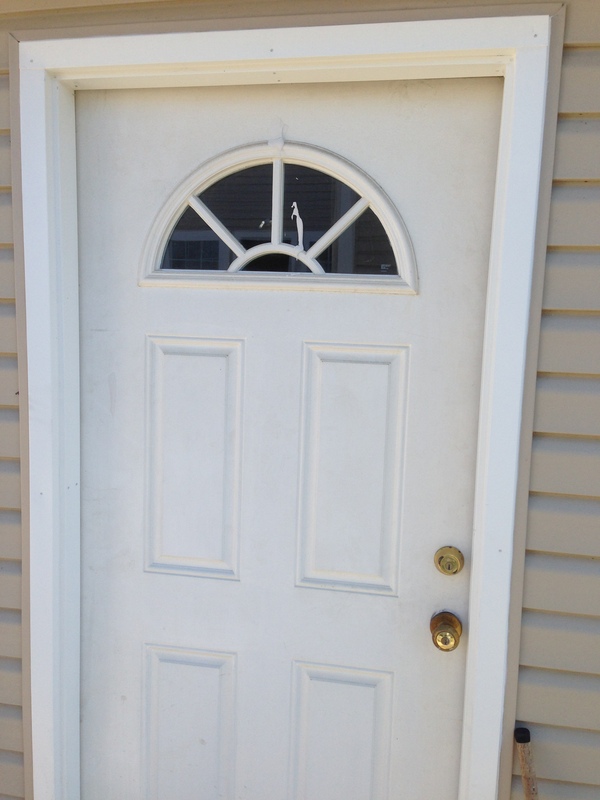 It is the most affordable way to give the exterior of your home a new face lift. And it has plenty advantages over its competition. First off, it is the easiest to maintain over the years. Unlike wood and stucco, it is stain repellant and does not stain up very easily. Its also easy to wash and keep up with, all you have to do spray it down with a 60% water 40% cleaner mixture and pressure wash it ever six months or so. No need to paint every year like wood. Vinyl Siding also holds it shape well and is extremely dent resistant unlike aluminum. Vinyl is also easily patched if something happens to a piece. There are plenty different colors and styles of vinyl siding, allow you to customize the exterior of your home to meet your acquired tastes. There are several different types of trim and corners that will set your home apart from the rest. You can go with ordinary , single color Vinyl with j-channels to just freshen up an outdated home. 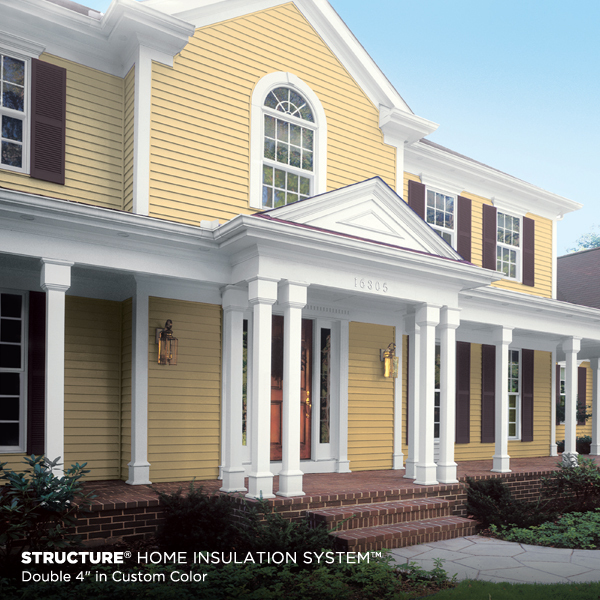 Or you can go all out with “Dura-Blend” two tone siding and decorate trim and fluted corners. We can also put extra bends in the aluminum fascial metal to give the eves of your home that elaborate look. We can even take it a step further and wrap all your exterior window casings, door frames, coloums, and beams with the aluminum face metal to give it that brand new look and eliminate the painting every year. We can completely wrap pretty much the entire exterior of your home with vinyl and face metal which will completely protect the exterior of the home while making maintence really cheap and easy. Take a look at some of the pictures below and see what your house can look like with a little vinyl siding. A door and window frame that we wrapped in the aluminum fascial metal so that the home owner would no longer need to paint them every year. The last four pictures are of the ceilings of a customers outside porches. We covered these with soffit so that they would no longer need to paint anymore. 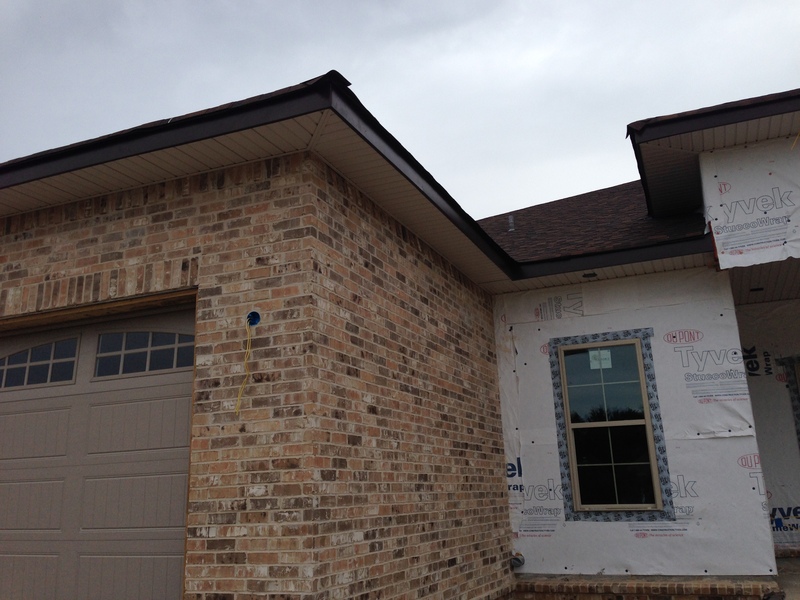 These two pics are Soffit & Fascia we did on a new construction home. We can also just build you one of these new houses if you rather that? 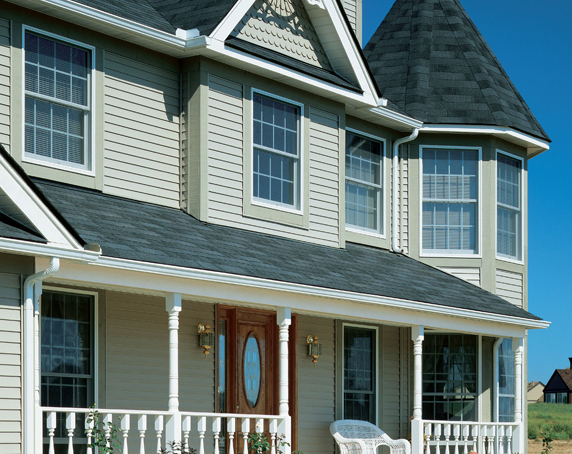 So, why choose His and Hers Construction to install your Vinyl Siding? First off, we take pride in every job that we touch and promise that it will be done right the first time around. We have plenty experience on our side. I have been installing Vinyl Siding for over 8 years and have mastered it. We only use thick, quality Vinyl products. 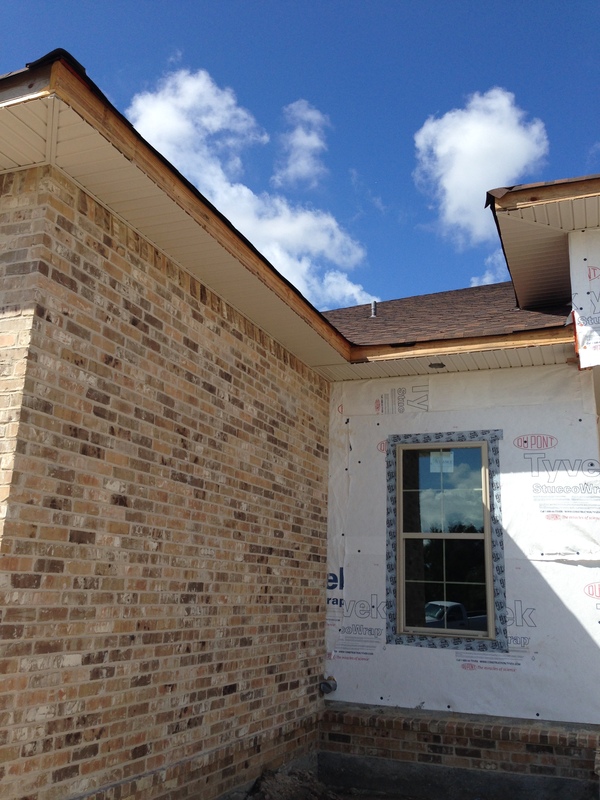 We also wrap the house with a Tyvek insulation barrier before the Vinyl goes up on the walls. This is to keep out the moisture and can be seen in the above photos. We make sure all of our miter cuts are clean and look professional. We make sure all nails are driven into studs and not just your house. We hang the siding with nails and not staples, so that we can float all the walls so that they look straight and not a wavy. All our soffit is screwed and not trim nailed so that it does not bow are warp over time. We can put extra bends in our facial metal to strengthen and decorate it. We take our time so that all our cuts are accurate, all our corners are tight and waterproof, and all vinyl comes out straight, square, and level. Our Vinyl jobs will last longer and look better! 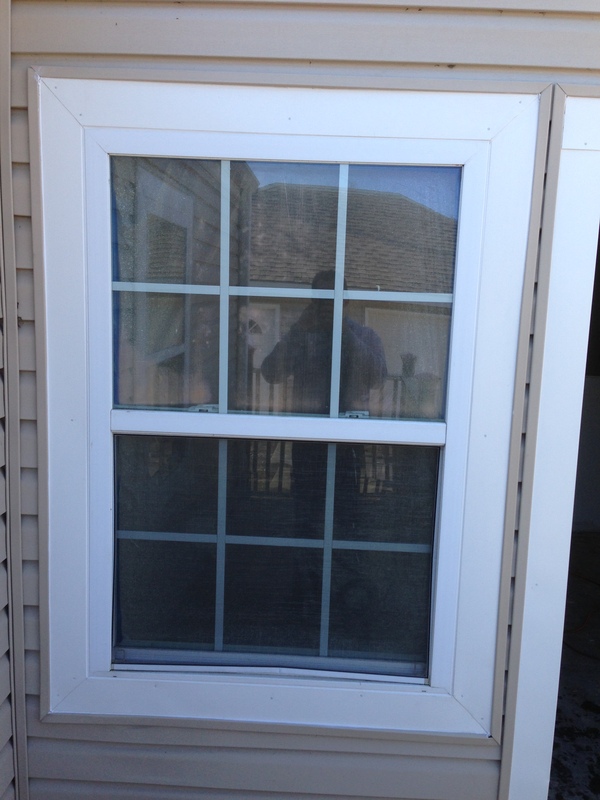 We promise that our Vinyl work will for exceed others and you will not be dissatisfied. We guarantee all of our work by baking it with a free 6 month warranty.